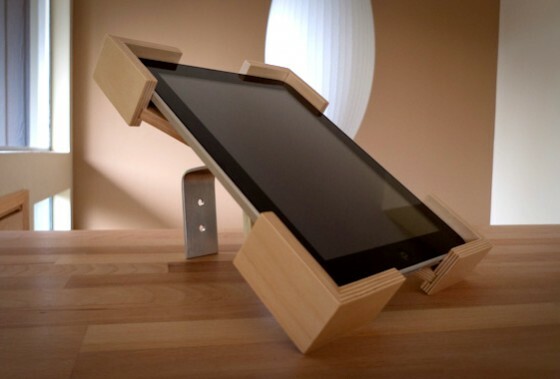 This wood iPad stand has a modern design style, featuring Apple plywood and aluminum bracket that can be mounted to a wall or simply sit on your desk. 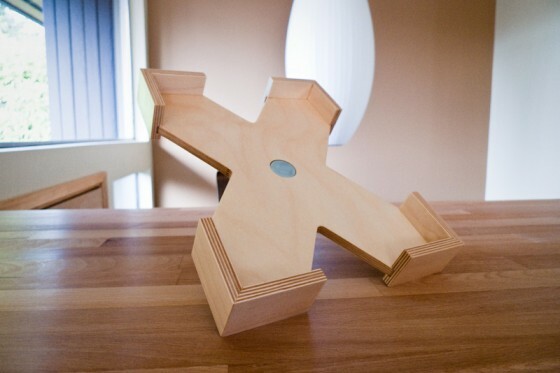 This is a great stand, especially if you’re looking for a hand made, unique and contemporary design style that is usable and more unique than the standard high tech looking stands currently available. The viewing angle is adjustable, vertical to horizontal. An easy to use thumb knob on the back allows you to adjust the aluminum stand to a horizontal or vertical viewing angle. The design allows for easy access for your USB connector and most audio jacks. 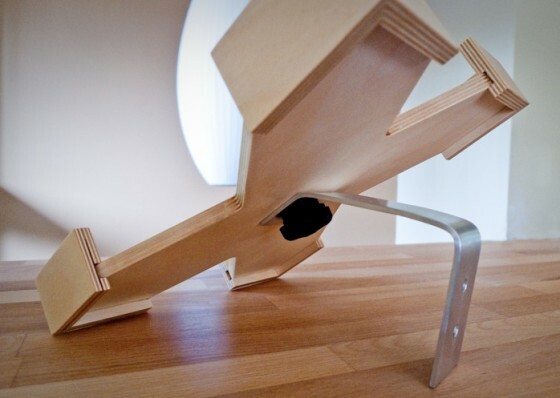 **Note, if you are planning to mount the iPad1 stand in the landscape position, you will need to order a shorter bracket which can be purchased for $10. Each piece is finished with a durable low-VOC water based topcoat. Joenel, I agree…. the stand could use a name. X-Stand is taken, and there are X-Pads etc. Wooden X-Stand is pretty good. Thanks for you comment. Such nice wood work but that design is destroyed bybthat godawful metal piece and thumbwheel my god usevwood forbyour support!!! Fresh, thanks for your honest opinion. I considered many options for brackets and felt the simplicity of the aluminum balanced nicely with the natural birch and the iPad. Also, this project was originally commissioned by Crossfit gym in Seattle. My client wanted the mixture of wood and aluminum… as he felt it worked well in his gym environment. And, that it complimented the design of the iPad itself. 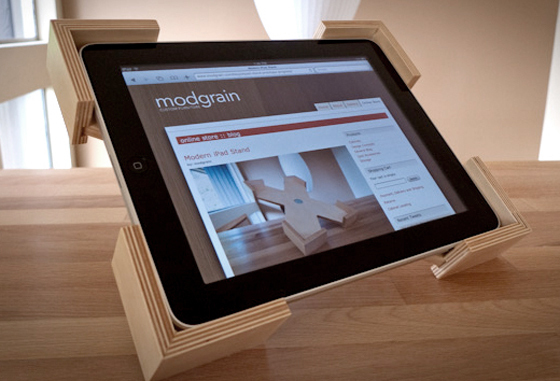 There are a bunch of “all wood” stands out there, so this stand is a nice alternative for some.